Autumn equinox: Auto detox. Are you ready? So summer draws to a close. There’s a chill in the air. The evenings are longer. The energy changes. We naturally start to become more contemplative as our bodies prepare for the cold dark days of winter. Our appetite begins to change to desiring warm filling meals rather than light ‘excitable’ salads and such. When the student is ready, the guru appears! 2 years ago, on a yoga retreat, I was introduced to an awesome teacher who changed my life. A petite brunette, with perfect posture, Barbara Wren has been teaching for decades and is longtime principal at The College of Natural Nutrition in Devon, UK. Her quietly spoken and perfectly annunciated talks, belied the radical content and revolutionary ideas behind them. We were in a beautiful old farm house near Oxford. 30-40 yoga teachers and students from all over UK and Europe. Sitting on the chairs, the sofas, the arms, the floor, cross legged, or stretched out. Sometimes napping, as the density of information and intensity of ideas, coupled with the early morning meditations, overcame our attention and interest. I took yards of notes. I button-holed Barbara at dinner and in the hallways. The information she gave us was SO joined up! It really resonated with me. So much so that I have set out on my own quest for understanding, which has continued to this day. Taking me into increasingly ‘unconnected’ and bizarre places, on the www! Which all turned out to be totally connected, relevant and fascinating! Barbara teaches on nutrition and physical homeostasis. Everything that happens to your body (and mind, but thats another article!) has an effect, and its all cumulative. So, poor nutrition in your mother’s womb, lack of the protective colostrum in breast milk and the ongoing antibodies Mum produces specifically for you; early weeks vaccinations; medical intervention. And this is all just to start!! This sets up an ongoing situation where your body struggles to maintain integrity, tries to create a strong immune system, but creates fertile ground for acute and then chronic illness which, more and more, is the life we lead. Barbara’s theory of ‘everything healthy’, is, that there is a chain of events, with inevitable consequences. The mysteries of why people move towards ME, MS, arthritis, mental illness, cancer, are not mysteries at all. She teaches the importance of the profile, a detailed history of how you grew up, what you ate, what drugs you were given, how childhood diseases were handled. The pathway towards illness, with its particular gateways and milestones, plays out over and over, becoming more and more familiar each time it is mapped. Each one of us is individual, and our life stories unique, but it soon becomes plain that the more of the milestones you have accumulated, the more likely you are to suffer debilitating and possible lethal illnesses. Unless you are a qualified MD, you are not allowed (sorry! I thought I lived in a country with free speech, but evidently not!! ).I repeat, not allowed to talk about ’causes’ of cancer etc, let alone ‘cures’. As if the MDs actually had the cures! The MDs hold the answers to the whys and wherefores. Or not! The papers constantly spout the latest bit of theory of this cause that, that causes this. Dont eat this, eat that, and next week, dont eat that, eat this! No wonder we are all confused, and gradually fall back to the pre packaged meals, processed everything, international input and quick and easy anything. In our childhoods we suffer acute illness, fevers etc. If we take the vaccinations and the suppressing drugs, we mess up the delicate, but powerful, development of our immune system, that bastion of protection which is our most important gift for the lifetime. In early adulthood, if we get onto the pharmaceuticals, they clag the system. Pain relief, hay fever, contraceptive, antidepressants. Later, the chronic problems begin. We spend more and more time at the doctor’s surgery. We bring home more and more drugs for this and that. I remember clearing out my mum’s medicine cabinet when she started with the naturopath, a hair-raising experience in itself! In the meantime, the food we eat is denatured, the water is chlorinated, the toothpaste fluoridated, the air polluted. The electromagnetism increases daily with, not only the electric grid surrounding us, but phones, masts, wireless pc networks, all operating at 100s of mHz compared to the human optimum of 4-12 mHz! Our natural systems are immaculate! Balanced, self- monitoring, powerful and self- sustaining. If we trust our selves, the very gift the Universe has given us, we naturally overcome the attacks of microbes, fungis, viruses, bacteria. In childhood, our mothers milk and then natural locally- grown food supports the development of our immune response. Bacterial attack challenges, but the mature maternal immune system provides immunity, and after 2 yrs, our own develops. The fever, scary though it is, is our way of burning out intruders. Each fever we successfully negotiate strengthens our ability to manage the next. As long as our brain is kept cool, the internal heat is not dangerous. To bring down the heat with supressants, rather than just wet towels, interrupts and ultimately destroys our energetic ability to burn. Interestingly cancer victims, AIDS sufferers, and even IVF children, all have significantly lower base body temperatures than is normal. And Barbara said that the ‘normal’ body temperature today is a few degrees lower than when she was first nursing!!? The interruption of the natural processes, and input of external poisons, threatens the health and well being of the system. The liver signals the toxification and overworked, stashes the toxins in fat it lays down. Where? Well girls, it’ll be legs, hips, later bellies, arms, and of course internal organs. Guys? Well, on your gut! That hard, persistent belly of the western man, is a direct result of toxofication. Visceral fat, surrounding heart, kidneys etc, pushes out the belly, so, even with no love handles, the waistline extends and extends. Fat is your liver’s way of protecting you from poisons in the blood stream! Thank you Oh Liver!! Protector of my heart and brain, saviour of my life and sanity! If the toxification continues, your body’s attempts at damage-limitation will be overwhelmed by the onslaught of poison. Which is why, after physical illness, comes mental deterioration. As the body fails to cope, the toxins get to the most vital organs of heart and brain, and after that anything can happen. The body is sophisticated in action, simple in overall operation, and once you get it straight, relatively simple to fix. Like any machinery, if you keep it clean, use it regularly, keep it properly supplied with fuel and lube, it will function well for decades. Barbara was chronically ill when she was younger, but now joins in and keeps up with our yoga sessions with the 20 yr olds! So, now, 14 September 2011. One week to the autumn equinox, and my son and I have colds. My son is a good example. No vaccines, no drugs in 12 years, good food, regular exercise. But he has never been ill! A few fevers, which I anxiously waited out, a few localised infections, but no constant colds and visits to the doctors, no Ritalin, no Calpol. Just ongoing energy, growth, intelligence and liviliness. The yoga retreat 2 years ago was in August. Barbara spoke about the Equinox coming up. 2 months later, I went to another weekend retreat where she was speaking. Many of the same attendees were there. I realised that Matt and I had had colds and flu, which was very unusual especially for him. So, now it has, let me share with you. 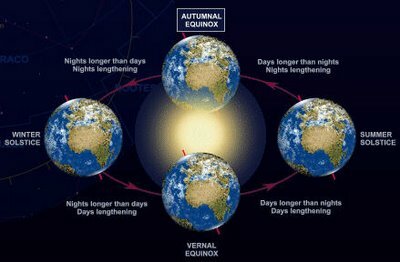 Every year we have 2 equinoxes, when the night and day are the same length. The crossing over of the energy from mostly light to mostly dark, and vice versa. This shift of energy changes the planet as a whole and its energy, relative to south or north of the equator, and distance from the poles. It also effects our energy. At equinox, the energy flips. This energetic shift, throws out junk at a cellular level, into the bloodstream and lymph, and hopefully out of the body. It is a 6 monthly opportunity to clean and clear the accumulation of rubbish which has settled in for a cosy ride. Whooops! You thought you could move into my body? sorry chum, house move time, and out you go! Whooa! Spring clean, autumn sort. Ready for summer, ready for winter, I feel better, energised, strong. If you support your body’s natural mechanisms, with natural local foods, suitable for your body and blood type, herbs, positive and empowering thoughts, and exercise regularly at an appropriate level, you will go through the natural cleanse of the equinox with a few superficial coughs and colds and maybe a temperature. Especially the use of cleansing techniques like hydrotherapy, enemas, deep breathing, which are powerful and gentle, encourage the body to slough off rubbish. Your skin will be clearer, your silhouette sleeker, your energy levels higher. But if you supress and poison further, the output from bloodstream to excretion will short circuit, the liver will repackage all that junk, back into the fat, back into the cells, back into all the nooks and crannies it was hoping to clear. Instead of clearing at equinox, in October the acute problems could increase, by November the chronic conditions worsen, the arthritis, the ME, the MS.
By Christmas the mental problems are in full swing, the depression, anxiety, even the psychoses. By Spring time the body is really ready for a clear out. Come March, the sniffles begin, the headaches, the aching joints. Again you have a choice, to clear or to supress. But if you dont understand what goes on, if you believe the advertisements and common wisdom and buy the over the counter cold tabs, you beat your body down again. Even more toxified, more weighted down. You move into summer with hay fever and other allergies, you are tired, listless, a bit hopeless and desperate. You take up Zumba, you have a facial to clear the pimples. You make new resolutions as the days lighten. But the solution is not to beat ourselves up, not to work harder with meds and creams and regimes. The solution is to release, let go and trust. Trust the awesome mechanisms of your body/mind. Eat simply- local food, with a similar energy pattern to your own. Cut out processed foods, including sugar and salt. Cut down your drug intake, investigate natural therapies like herbalism, homeopathy, flower essences, hydrotherapy, naturopathy – many of these are cheap, safe and can be done at home with little kit and caboodle. Do gentle exercise and get back in touch with your 5 senses, even your 6 senses! Read Barbara Wrens book ‘Cellular Awakening’ and investigate her wonderful solutions. Wonderful solutions passed down to us by generations of our forebears who were strong, knowledgeable, and in contact with the ground we live on and all its bounty. Welcome your own rising star! Barbara’s main theme is that each one of us suffers if we do not express our uniqueness, our talents, abilities, opinions and wisdom. Nutrition is a first step towards self-discovery. Cleaning up so we can see and feel clearly. Allow our authentic voice to ring through, our authentic presence to empower our day to day life. Be who we are, with courage, passion and integrity. Becoming fearless, we empower those around us to do likewise. Each one of us carries within the sparks, not of potential greatness, but actual, realised greatness. Once we stop dancing to the corporate tune, go into quietness and discover our own beautiful melody, we shine. The light literally transmits from clean cell, to clean cell, causing our heart to open, our love to grow, our intellect to resonate with every other intellect in the Universe. If one of us dares to let that light shine, like a candle set on a candlestick, or a great city on a hill, it is apparent to all, and some may even see it and be ready to start shining too! So today I wish you the very best Equinox season. Be brave as you read and assimilate. Learn more. Recognise the resonances and take action. If you are ill, this is the pathway back to health. If you are tired, this is the way to energy. If you are frustrated with your life and path, go within, find your sweet melody and begin to hum it gently, till it fills your body, your mind, your heart, and then your life. Life is worth living, Truth is worth sharing. Wounds can heal, hurts can be resolved. Namaste! Om mani padme hum!